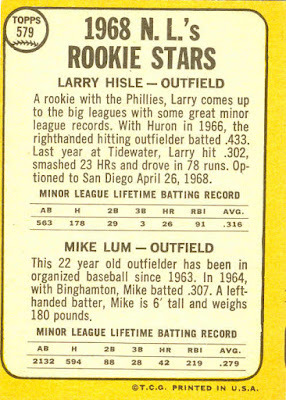 Larry Hisle was handed the Phillies' starting center field job to begin the 1968 season, but flopped miserably, and after only 7 games was sent down to AAA for much-needed seasoning. 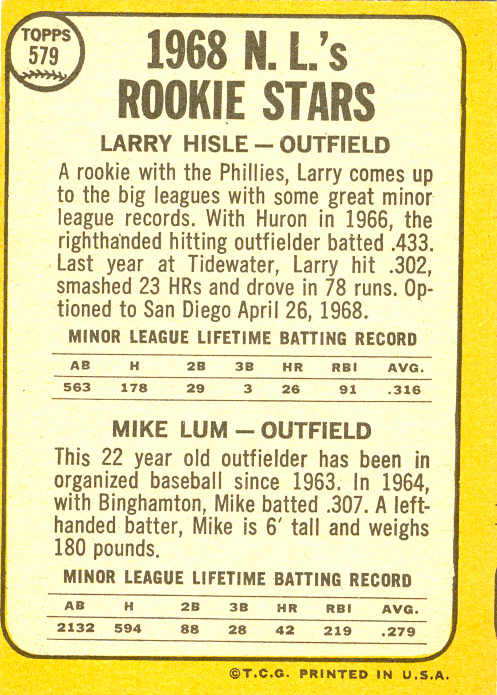 He returned the following spring as the #1 center fielder, and after a great rookie season, slumped in 1970 and split 1971 between the Phillies and the minors. 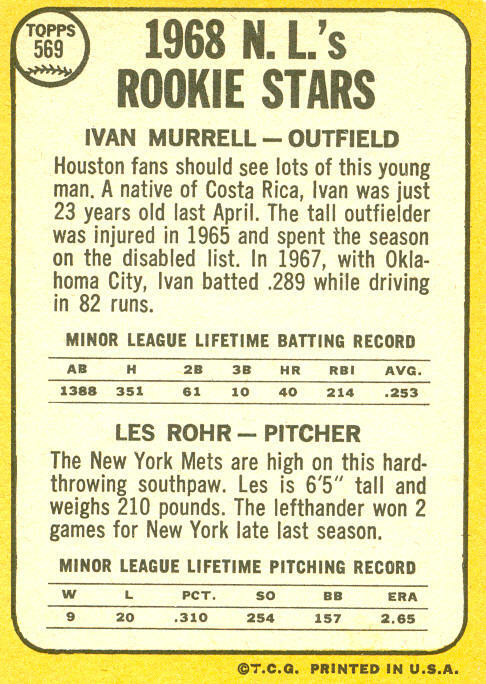 He later played 5 years with the Twins (including a career year in 1977) and 5 years with the Brewers. 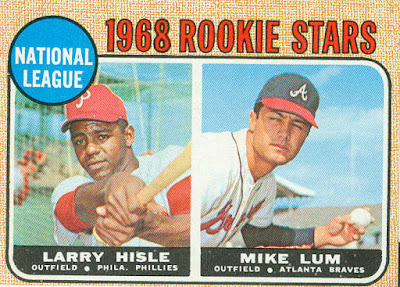 Mike Lum played 8 full years with the Braves (1968-75), and was then a part-time player for the Reds (1976-78) and Braves (1979-81). 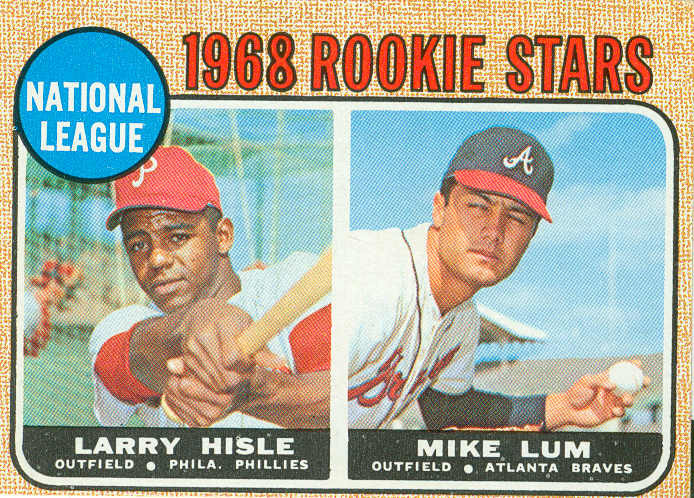 He was the Braves’ regular right fielder in ’71 and ’72, the years when Hank Aaron played 1st base. 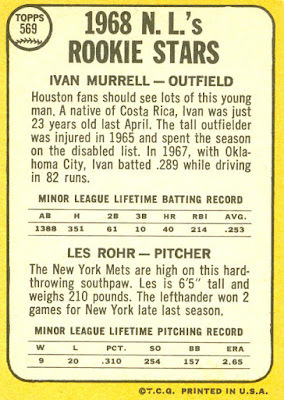 After cups of coffee with the Astros from 1963-68, Ivan Murrell was drafted by the expansion Padres in 1969 and played 3 full seasons in San Diego as a part-time outfielder. 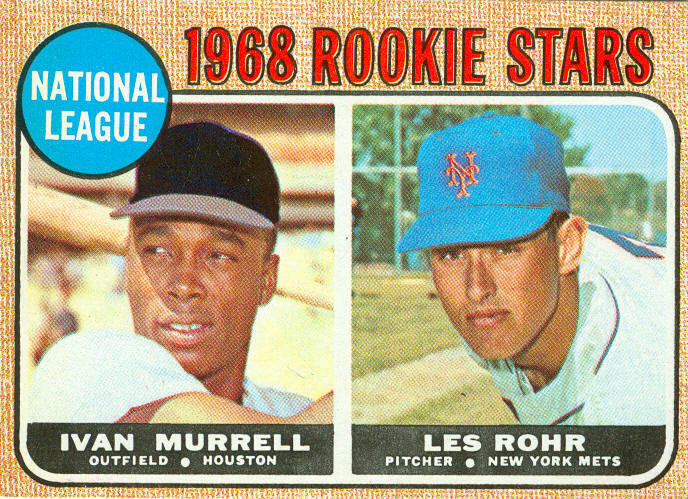 Murrell bounced up and down between the Padres, Braves, and their minor-league teams from 1972-75, then played in Mexico from 1976-83. Les Rohr pitched in the Mets’ farm system from 1965-70, and saw action in 6 games with the Mets between 1967 and 1969. 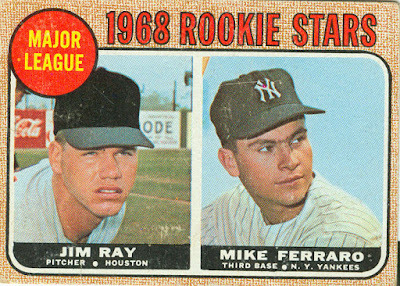 Jim Ray pitched a few games for the Astros in ’65 and ’66, then was a bullpen mainstay from 1968-73. 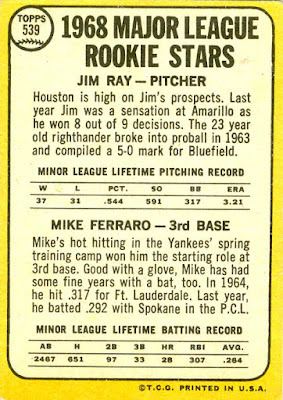 He finished his career in 1974 with the Tigers. 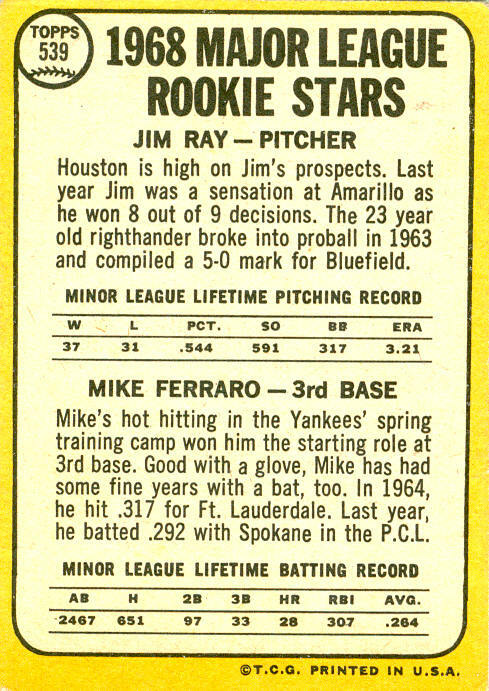 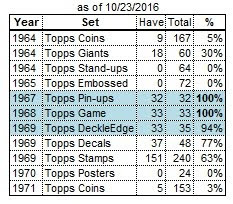 I was surprised today to see how short Mike Ferarro’s MLB career was. 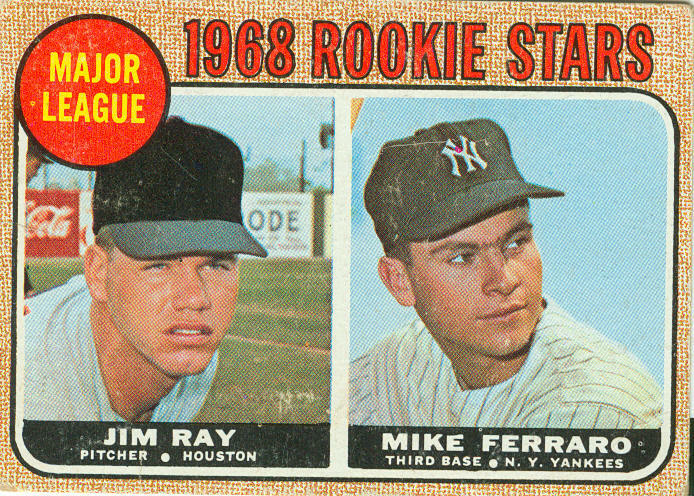 Although he played in the minors from 1962-75, he only made brief appearances with the Yankees (10 games in ’66, 23 in ’68) and Seattle Pilots (5 games in ’69) before his only season as a regular in 1972 (124 games for the Brewers). 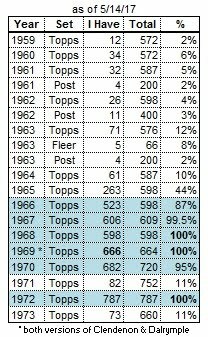 He also managed the Indians in 1983 and Royals in 1986.